Why is creativity critical to a company’s success? Creativity isn’t some luxurious indulgence that we can only afford in good times. And it’s not a special function of an organisation that should be hived away into a separate department. It’s what makes human life different from the rest of the earth. We’re born with immense natural powers of imagination and creativity, much more so than other species. Music, science, technology, philosophy, architecture … we live in this virtual world of ideas and theories, of values and great breakthroughs of human culture. All companies start that way too; they start with an idea. Too often, organisations hire people on the basis of their academic profiles. But highly qualified graduates often struggle to think creatively because they’ve been trained by their education to be compliant. In companies, it’s strategically imperative to recognise that the vitality of the organisation depends upon the ideas of the people who work there. The best technologies on their own won’t generate a culture of creativity and innovation. These are just tools that we use. Developing a culture of innovation means knowing the conditions in which ideas can flourish. If you just want efficiency — if you want to make thousands of motor cars or garments — you may develop a command and control mentality, but in doing that you may be missing out on real opportunities for innovation. If you really want a culture of innovation, you have to lead people differently, value them differently, and encourage them differently. Understanding the revolutionary times in which we are living and why creativity and imagination are more important than ever before. Thinking differently about ourselves and challenging common misconceptions around our own creativity. Learning what leaders need to do to create a culture of habits that promote creativity and innovation. "Copernicus, Galileo, and Kepler did not solve an old problem, they asked a new question, and in doing so they changed the whole basis on which the old questions had been framed." His 2009 book, The Element: How Finding Your Passion Changes Everything, is a New York Times best seller and has been translated into 21 languages. A 10th anniversary edition of his classic work on creativity and innovation, Out of Our Minds: Learning to be Creative, was published in 2011. 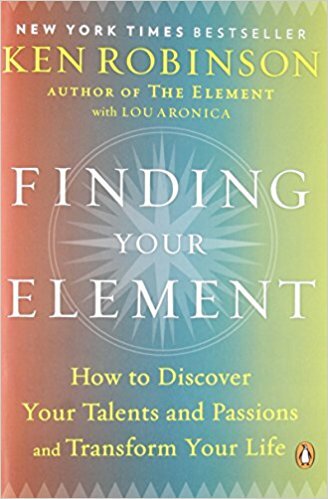 Finding Your Element: How to Discover Your Talents and Passions and Transform Your Life is also a New York Times best seller.